There weren’t any speeches or pyrotechnics. No fanfare whatsoever, save for a few seconds of self-conscious applause. 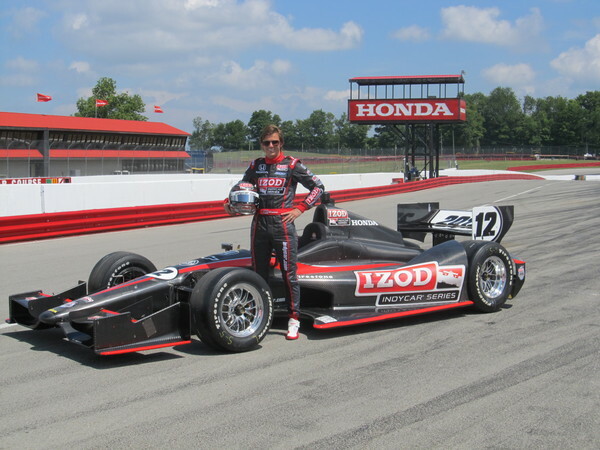 But the broad smiles of individuals involved in getting the 2012 IZOD IndyCar Series car on the Mid-Ohio Sports Car Course for its initial test session neatly summed up the day. Reigning Indianapolis 500 champion Dan Wheldon, as is his custom, patted the black and red-striped Dallara Automobili-built chassis with the road/street course prototype body kit three times before climbing into the generous cockpit for the first of 12 scheduled days of itemized evaluation on three road course and three ovals. A few minutes later, the roar of the 3.5-liter normally-aspirated V-8 engine as cars exited the appropriately-named Thunder Alley less than 24 hours earlier during the Honda Indy 200 at Mid-Ohio was replaced by the smooth, higher-pitched sound of the 2.2-liter turbocharged Honda V-6 engine that will be among the three (Honda, Chevrolet and Lotus) implemented for the 2012 season. Dallara’s proposal of a rolling chassis – a universal car dubbed the IndyCar Safety Cell that comes complete but for tires, the steering wheel and driver seat, and with different body coverings for ovals and road/street courses – was recommended to the sanctioning body by the seven-member advisory committee in July 2010 after it reviewed multiple manufacturer concepts. It will replace the chassis that came on line in 2003 and was built for oval racing (the first INDYCAR road/street course race was in 2005 at St. Petersburg, Fla.). The public will note the differentiation in bodywork on the variety of racetracks. Teams, according to Dallara U.S.-based quality control leader Sam Garrett, will appreciate the cost savings -- beyond the initial chassis purchase price -- in replacement parts. "It's a lighter car, it has more horsepower and it has a lot less drag than the current car, so naturally on the right day it will go quicker and that's something that the fans have to look forward to," Cotman added. "I think it also will provide a different type of racing with different engine manufacturers, too. I will be interesting, it will be exciting and it will be a bit of a change." A Dallara facility that will be open to the public is nearing completion in Speedway, Ind., where design, testing and production will continue. Systems confirmation will continue through the end of September, with the next test on the 1.5-mile Texas Motor Speedway oval. “We need to make sure the parts from all aspects of the car are achieving their goals so we’ve got aero targets and straight-line speed targets that we’re looking to see,” INDYCAR vice president of technology Will Phillips said. “We want to make sure the basics are right first before we go pushing for those targets." Engine manufacturers – each of whom have ordered a next-generation chassis – will commence testing in early October with their respective aligned teams. So far, Chip Ganassi Racing, A.J. Foyt Racing and Sam Schmidt Motorsports have signed on with Honda. Team Penske is the anchor team for Chevrolet. Teams are scheduled to receive their first chassis in mid-December. a refined man of speed, combining modern elements with traditional notes. Like most American kids that grew up in the 80's, I watched the Indy 500 every year and became interested in motorsports thanks to that race. I didn't really get hooked on motorsports however until I started watching Formula 1 racing in the late 90's, my favorite era with the great Mika Hakkinen/Michael Schumacher battles. (I was a Mika Hakkinen fan) So my fondness for Formula 1 waned once Mika retired and Schumacher started winning everything, even at the expense of his teammates. After I stopped watching F1 I quickly latched on to A1GP, a new racing series that I thought was a unique idea and had some promise. Sadly, it ran into financial troubles and folded after just a few years. Then I turned to Champ Car racing here in the US for my motorsports fix. However that was quickly extinguished once Champ Car and Indy Car merged and we were stuck with Tony George and his many foibles. (It was entertaining to watch the Hulman/George drama I'll admit.) My interest has been less than lukewarm with Indy Car lately, even without Tony George at the helm. Over time however, the excitement I once had for motorsports has slowly gone. Maybe it has to do with my age, I don't know. But I think I will pour my efforts into my Trooper and my new interest in off-roading. Thanks for checking out my blog, I hope you enjoy it. I will still post racing news when I find something interesting or noteworthy. New 2012 Honda/Dallara Indy Car?